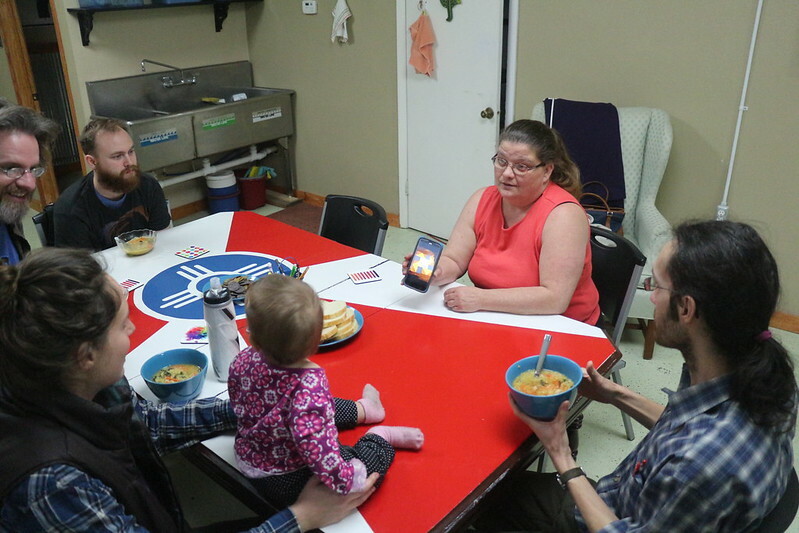 What seems like a simple goal of knowing your neighbor is the centerpiece of SoCe Life, a 3-year-old Wichita-based nonprofit co-founded by two ordained ministers from the Great Plains Conference. “The thing that sums it up best is being good neighbors,” said the Rev. Adam Barlow-Thompson, who started the group with his wife, the Rev. Ashley Prescott Barlow-Thompson, and friends Matt and Catherine Johnson. The Barlow-Thompsons and the Johnsons met in a small group with a desire to have a deeper connection with their faith, Adam said. They formed an intentional community based on prayer, hospitality and justice in March 2014. Before long, three of them started a folk trio (Catherine is the manager/roadie) called Brutal Bear. Eventually the Barlow-Thompsons moved across the street from the Johnsons, who had lived in the south-central area of Wichita since 2008. “We have felt really called to be here, and just have a certain love for the neighborhood and for our neighbors,” Matt Johnson said. Hoping others would feel that same sense of neighborhood, they started SoCe (shorthand for South Central) Life as a nonprofit in March 2015. “We began knocking on the doors and interviewing people in the neighborhood in August of 2015,” Catherine Johnson said. Getting to know the people of their neighborhood – which they define as a 2 square-mile area of Wichita from Kellogg Avenue to Pawnee Street, and the Arkansas River to Washington Street – has been the primary goal of SoCe Life. Approximately 10,000 people live in that area, which encompasses about 50 city blocks. The neighborhood has a reputation for drugs, human trafficking, prostitution and homelessness, the SoCe organizers say, with higher rates of poverty and unemployment and lower rates of high school graduation. It is a transient population, they say, with more renters than homeowners. The first step was to recruit “block connectors,” who would interview those on their street. “We find one person on each block to just get to know the people on their block, on both sides of the street, and find out what they like to do – what they’re passionate about, what skills they have,” Catherine Johnson said. So far, connectors have particularly struck a chord with gardeners. It’s also helped create SoCe Life’s first signature item, 3-foot by 3-foot, 2-foot tall garden boxes as a way to build community by sharing the healthy food they’ve grown. It’s also – no surprise to the neighbors who’ve started a band – created its own music appreciation society for listeners and jammers. The skills don’t have to be intense – sometimes connections are made by pairing someone with a vehicle and spare time with a neighbor who needs a ride to a medical appointment. The outreach also has branched out into yoga classes and other means of getting together with common interests. SoCe Life’s headquarters is a small storefront on Gilbert Street in Wichita. Funding for the program has come from grants that pay for salaries and rent. Although one of the programs is an “inspiration night” with interactive devotions, the founders say having a church is not in the long-term plan. Adam Barlow-Thompson was assigned to SoCe Life by the Great Plains Conference after serving a church in Derby, Kansas. Ashley Prescott Barlow-Thompson is children’s ministry director at College Hill UMC in Wichita. Matt and Catherine Johnson attend a United Methodist Church in Wichita. Although the SoCe Life building is in the shadow of a former United Methodist Church, Adam Barlow-Thompson said he sees the group as asking questions of the church more than following it without question. In the interview setting, he said, the church isn’t mentioned. Matt Johnson said the neighboring movement is about bringing out the best in individuals. “If the conversation is built around ‘What are your skills?’ and ‘What do you love to do?’ you’re reconnecting with the original goodness that God planted inside of them,” he said. “That’s a conversation that people really enjoy. People get really excited. If a person loves to cook and you ask them about that, they light up.